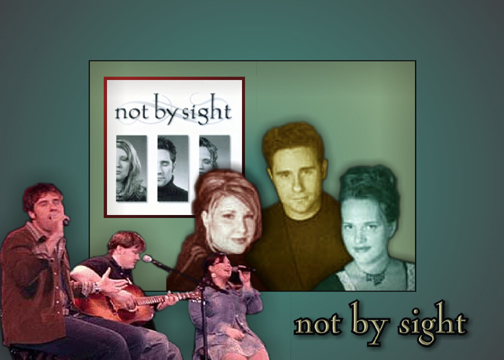 Not By Sight Mission Statement: Through their music, they are led by the Holy Spirit to create a powerful spiritual experience, bringing messages of hope and healing through Jesus Christ to the world. Naomi and Nate, sister and brother, have been singing together for a very long time, as their musical gifts appeared very early, by the ripe old ages of 5 and 7. They were the children of a Pastor and Mrs. Thompson, ie "Daddy and Momma", who would take their family and travel around, spreading the Gospel. At the age of 11, Naomi began to write and compose songs. Growing up, they listened to other types of Christian music as well. Early influences included Steven Curtis Chapman, Cindy Morgan, and Michael W. Smith. By their young adulthood, both found Southern Gospel singing groups to perform with;Testify and The Martins. By 1999, Naomi and Nate both felt the Lord's calling to start their own music ministry, so they left their comfortable, established singing groups and they stepped out in faith, forming Not By Sight, as Christian contemporary duo. They started traveling to churches in their home state of Louisiana, a familiar way to spread the gospel from their past..They wrote music different from their southern gospel roots, for NBS, but with some elements of southern gospel still included. They performed for audiences, full concerts of a combination of original songs and songs of other artists as well. Naomi met and fell in love with Marty Carroll, a Marriage and Family Therapist, from Oak Grove, Louisiana. Naomi and Marty got married, and after prayerful consideration, they moved to Oklahoma City, Oklahoma, to work with the students of Mid-American Christian University, following the Lord's leading. Nate stayed behind, and it was uncertain whether they would be singing together. After many months of prayer, Nate joined his sister in Oklahoma City. In Oklahoma City, the third member of Not By sight, Rachel Whetstone joined the group, changing Not By Sight from a duo into a trio. Marty Carroll, besides being a Marriage and Family Therapist, came along also as the sound tech/road manager. More About Naomi Thompson Carroll, Marty Carroll, Nate Thompson, and Rachel Whetsone. Nate has begun writing as well as playing guitar. He also lends creative contributions to the vocal arrangements that have created the unique sound that is NBS. Nate is currently working as a youth pastor in a local Oklahoma City church. Naomi - Naomi has become an accomplished songwriter and often collaborates with her husband, Marty. She is experienced in production and vocal arrangements, and her songs are being sought after by other artists. Marty Carroll, Naomi’s husband, is their sound tech/road manager and also happens to be legally blind. He is Not By Sight personified! "His testimony will make you 'see' your life in a different light. He is an experienced speaker and is a powerful communicator. From the beginning Marty has been a driving force behind the vision and mission of NBS." the CD, WORK IN ME. Rachel is now married to Luke Mosher as of September 2003. Rachel is currently working for Mid-America Christian University in OKC, OK. She is teaching music and leading worship with her dad. Musical composition always offers subtle support for interesting melodies, strong vocals and harmonies. A strong favorite of this reviewer. Rhythmic introduction of piano, touch of organ, guitar, light percussion sets the mood and intro to melody flowing. Very strong vocals carry the melody and message of the song. Naomi and Nate take turns singing the verses, giving a nice change of voice. Very nice vocal arrangement, lovely harmonies from all three of them. Effective dynamics, especially enjoyed the vocal build-up in the Bridge, soft dynamics start in the first verse, slowly build to the chorus. Nice acappella singing in the beginning of the 3rd time through the chorus. Naomi: I thought if I gave up TV, I would be ok. Give a little more money, in the offering plate. Nate: The Lord would be so incredibly pleased, He'd see my love for all I 'd given up. Naomi: If I could change my body, be a little nun, recreate the surface, it would change my life. Nate: The Lord came to me, so quietly, He said that's good but it's not what I need. Chorus: All that I require (I require) is that you lay down your life with mine . All I desire (I desire) Is your willingness to die. I'm the sacrifice. Second favorite song of this reviewer. Song describes the Lord's feelings toward human beings; his love for us, how precious we are in his sight, He longs for a relationship with us. Song gave this reviewer the chills...Strong, poignant lead vocals by Nate carries the melody, expressing the meaningful lyrics, supported by lovely harmonies sung by Naomi and Rachel. Composition itself offers a haunting, sad melody written in a minor key, which reflects the Lord's sadness and longing, when human beings look at themselves through the world's standards, and not how He sees them. Starts off softly with strings, bongos, piano, mournful electric guitar. Lyrics: Why do you run and hide away? I know there's beauty in your face, what is this creature that I made, so afraid of Love? What must I say, how can I prove, convince this world, especially you, just how happy you would be, if I were with you and you with me. Chorus: You are beautiful to me, beyond the brilliant galaxy, the angels gaze down on the children of my love, yeah... You are precious in my sight, I want to give you a better life, what will it take for you to believe that you are beautiful to me. You are beautiful to me.... the angels gaze down... .on the children of my love, .... what will it take for you to believe. Track 3: BORNE - Words and Music by Naomi Thompson Carroll - Just Nominated for a Dove Award for Inspirational Recorded Song of the Year! Naomi comments: 'BORNE' was written during a very difficult season for me. I struggled with severe neck pain that left me immobile for days and weeks. I used all of my vacation and sick days at work and just simply felt worthless. Here I was newly married and was unable to serve my husband or my job well. As if the physical pain wasn’t enough I also began to struggle with depression and my emotions were uncontrollable. Ultimately, I was flat on my back before God and was so tired of my flesh! It was there that God reminded me that because of my flesh I needed Him…and for that I could be grateful. I began to look at this pain we all deal with daily…our 'flesh'…as a thorn (like Paul) to remind us we are ''Borne of dust, we get so dirty…but the Lord will pick us up, brush us off, and send us on our way!"